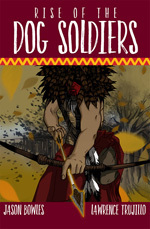 Larry Trujillo and Jason Bowles have written the novel Rise of the Dog Soldiers which contains a narcotics and terror plot set in New Mexico and the southwestern United States, with a unique twist, involving the nation’s first “special forces”: the Cheyenne Dog Soldiers. The Dog Soldiers, once thought to be eradicated, are rumored to still exist to this day. They make a powerful and unforgettable appearance in this first novel in the series. Middle Eastern terrorists hire a Mexican drug cartel to smuggle them into the United States across the border of Mexico. Once in the United States, the jihadists head north and hide in the Navajo and Hopi Indian reservations in New Mexico and Arizona. They plan to pilot and crash several ultra-light planes equipped with fire bombs. FBI Special Agent Maria Spencer leads a team to find the terrorists and arrest or eliminate them. Spencer recruits Navajo Nation Criminal Investigator Joe Eagle to help her.